Look if you haven't heard about this yet, you really are reading all of the wrong pages! Wizards of the Coast appear to be receiving pre-orders for the reprints of the 1977 Advanced Dungeons & Dragons rules. This is a really interesting move for Wizards and raising money for the Gygax Memorial Fund seems like a really sweet idea. I always think that when WotC say that they looking back at earlier editions it's just a ploy to convince players of older editions that they'll like the new unrecognisable ten book system. "It's zee same game"
So if you're not sure about buying smelly old editions from ebay or a shiny Lulu copy of OSRIC has no interest for you, then this is your opportunity to read the texts many of us worshipped back in the way-back salad-years hazy-70s-80s day. If they truly are identical, and you only want to buy one book, I really must recommend the Dungeon Masters Guide, which is organised is the strangest of ways, but is a delight to read - also note that in the appendix is a full list of monsters stats -if you don't have the Monster Manual to hand. 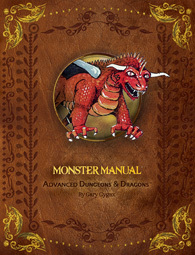 On the other hand The Monster Manual would make a perfect gift the players and non-players alike, it's not everyday you get the see so many unique descriptions of so many creatures from so many different stories in one book, also Gygax claims to have started work on the MM first. It has been mooted on a few blogs and forums that it is possible to play many games with the player's guides alone, in this case maybe playing original AD&D is workable with just the Player's Handbook - after all, it contains all of the classes equipment, spells, classes and rules for combat. In many ways, by buying the reprints of AD&D (1st edition) its as far back as you can get to the original ideas and dice mechanics without going down the ebay-collector and retro-clone routesin that search for OD&D. My only problem with the Premium editions (and I know I'm not alone here) is that they could have used the original art as opposed to these new tributes, but maybe they are actually trying to sell it as a complete game for a new generation, or maybe it's an art "rights" thing. The new art pays loyal tribute to the originals, though. By the time I was playing, the covers had been revised and replaced with the Jeff Easley art (with the exception of Fiend Folio). I was playing in a group which was borrowing from the, then frighteningly modern, Unearthed Arcana (and later Oriental Adventures) which was the first serious reorganising of the rules before the much needed and overdue 2nd edition AD&D was released.